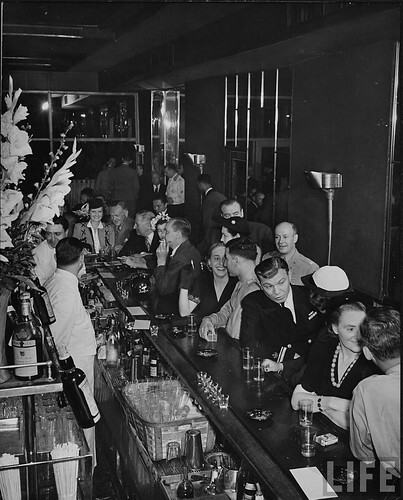 The Stork Club cocktail, a liquid relic of Old New York. A couple of evenings ago, deterred from going out to dinner by the arctic cold, we turned to Dale DeGroff. No, we didn’t ring him up; we opened up his “Essential Cocktail.” From the extensive menu, we selected the Stork Club cocktail, a relic of one of New York’s greatest old night clubs. The Stork, opened in 1929 by Sherman Billingsley, was among the most exclusive night spots in Old New York. A seat in the club’s storied Cub Room signaled your arrival. 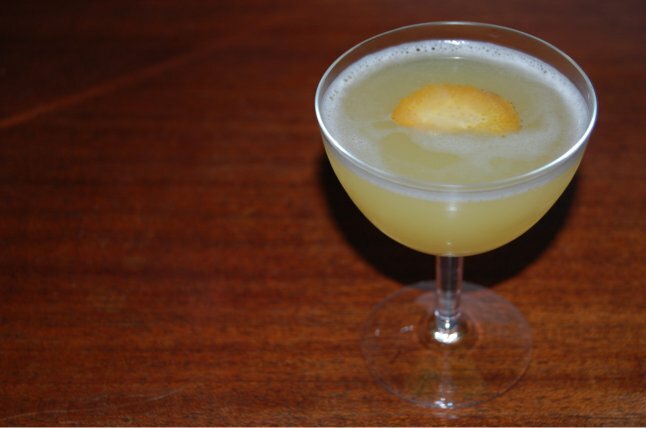 Among the cocktails sipped at the Stork Club, was its siganture, a gin, Cointreau and citrus and Angostura. It was one of countless cocktails mixed every night at the bar, left. We were pleased — particularly because DeGroff’s recipe called for a flamed orange peel, which is accomplished by lightly seering a small peel of orange. Combine your gin, Cointreau, orange juice, lime juice, Angostura in a shaker over ice. Shake over ice and serve up in a cocktail glass. Garnish with the orange peel. 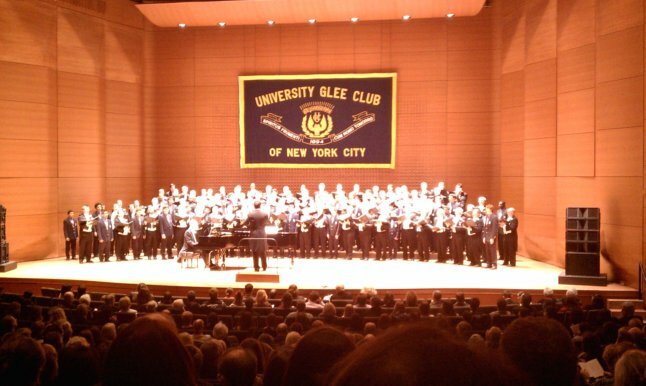 The University Glee Club performs last Saturday evening at Lincoln Center’s Alice Tully Hall. We spent last Saturday night in town, attending the University Glee Club’s 233rd Members’ Concert at Lincoln Center. The show, which featured our own Will Briganti in the bass section, was held at the Starr Theatre in Alice Tully Hall. It was a terrific taste of Old New York — indeed, the UGC was founded in 1894. Its repertoire was pleasantly varred — from “Lo, How a Rose E’er Blooming” to “Ain’a That Good News.” College songs are an important part of UGC tradition, too. The Whiffenpoofs of Yale were on hand for a portion of the show, and at the concert’s conclusion, “Bright College Years” was delivered. Old Yalies in the audience all stood. Before the show, we dined at Shun Lee West, the West Side institution. Surprisingly good cocktails and better-than-average Chinese fare. Afterward, we decamped to P.J. Clarke’s western satellite. Looking forward to the next show in May. 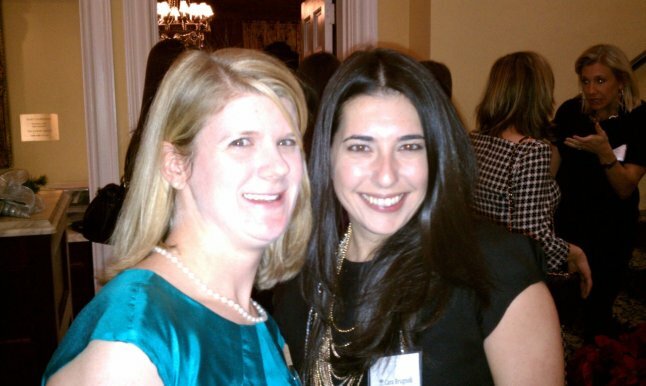 Mrs. F. and Cara Brugnoli, co-chairs of the New York Junior League’s 39th annual Golden Tree holiday shopping fair. The better part of my weekend was spent at the East 80th Street headquarters of the venerable New York Junior League. Mrs. F., her co-chair, Cara Brugnoli, and a crack corps of other Junior Leaguers were hosting the 39th annual Golden Tree holiday shopping fair. The event, which ran from Thursday, Dec. 2 through Saturday, Dec. 4, was expected to raise nearly $80,000 for the League’s host of outreach efforts across the city. Nearly 70 restaurants, retailers and individuals contirbuted silent auction items, wine, gift certificates, holiday wreaths and door prizes. Among the 56 vendors who participated were J. McLaughlin, Lilly Pulitzer, Magaschoni, The Linen Shop of New Canaan, Jack Rogers and C.K. Bradley, which delivered one of its final trunk shows. Owner Camilla Bradley is in the process of setting up a line of skiwear. Crowds packed the League’s headquarters on Thursday and Friday night. Live music filtered through the four floors of The Astor House and Maker’s Mark Bourbon, Zyr Vodka and Harpoon beers were all available for tastings. 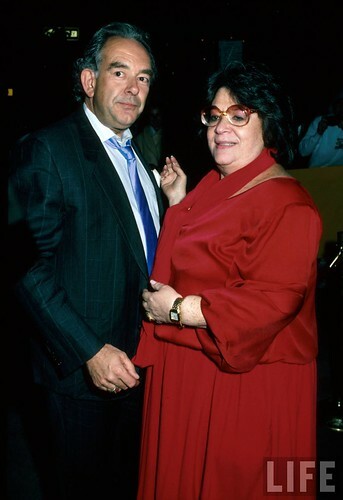 Robin Leach and Elaine Kaufman, 1980s. Image courtesy of the LIFE archive. Last night, the place to be was Elaine’s. My in-laws were in town and they were good sports — they agreed to wander down to the famous Upper East Side watering hole after a late, light supper. We were among the hundreds who descended on the place to mourn Elaine Kaufman, who died yesterday at 81. Born in the Bronx in 1929 and raised in Queens and Washington Heights, Kaufman opened her restaurant in 1963. The former Austro-Hungarian restaurant became the salon and clubhouse of the city’s media and literary elites. John Lindsay, Jackie Kennedy, Woody Allen, George Plimpton, Bill Buckley, Gay Talese and scores of other Old New York players were all regulars. 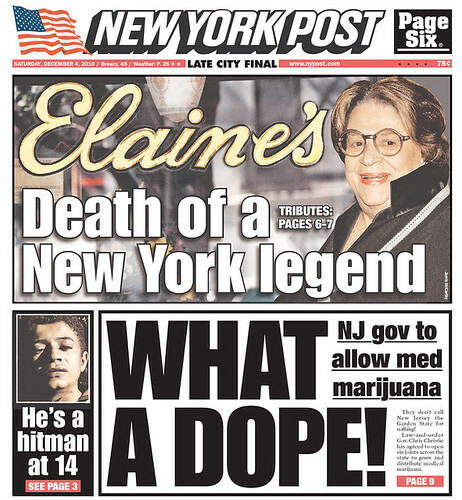 Predictably, the city’s media are in a dither about Elaine’s passing. This morning’s Post is chock full of tribute coverage, though that’s hardly a surprise as editor Col Allan is a regular. New York magazine has a piece online — and the Times is on the case as well. Another Old New York institution we’ll never forget.